What was the Tonkin Resolution? It came in August 1964 with a brief encounter in the Gulf of Tonkin, the waters off the coast of North Vietnam where the U.S. Navy posted warships loaded with electronic eavesdropping equipment enabling them to monitor North Vietnamese military operations and provide intelligence to CIA-trained South Vietnamese commandos. One of these ships, the U.S.S. Maddox was reportedly fired on by gunboats from North Vietnam. 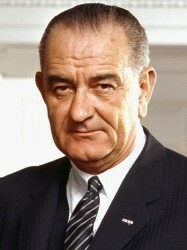 The reported attack came in the midst of LBJ’s 1964 campaign against hawkish Republican Barry Goldwater. President Johnson felt the incident called for a tough response and had the Navy send the Maddox and a second destroyer, the Turner Joy, back into the Gulf of Tonkin. A radar man on the Turner Joy saw some blips, and that boat opened fire. On the Maddox, there were also reports of incoming torpedoes, and the Maddox began to fire. There was never any confirmation that either ship had actually been attacked. Later, the radar blips would be attributed to weather conditions and jittery nerves among the crew. The War Powers Resolution came as a direct reaction to the Gulf of Tonkin Resolution, as Congress sought to avoid another military conflict where it had little input. The National Endowment for the Humanities website Edsitement offers teaching resources on Tonkin and the escalation of the Vietnam War. Read more about Vietnam, LBJ and his administration in Don’t Know Much About® History, Don’t Know Much About® the American Presidents. The Vietnam War and the Tonkin Resolution are also covered in a chapter on the Tet offensive of 1968 in THE HIDDEN HISTORY OF AMERICA AT WAR.